Below are some Math bingo cards, that were prepared using our bingo card maker software. 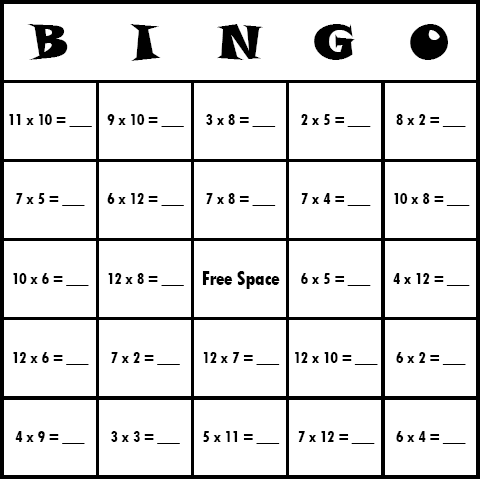 Obviously we could not hope to create bingo cards covering every possible math topic, so for this example, we have chosen to create bingo cards around multiplication tables. If you download our Bingo Card Printer, you will find it includes many ready-to-use math bingo activities, or you can create your own customized bingo cards on any subject that you like. If you want to create your own custom Math bingo cards (perhaps with more bingo cards, different items, using colors or fonts, etc. ), then why not download bingo card maker software? You'll be amazed how easy it is. Or, download math.zip which contains the PDF, and the Bingo Card Printer project (BCP file) which you can open in the bingo card maker software, and use as a Math bingo template so that you can easily create custom Math bingo card printables.